Was he Milton Franklin Andrews, Wilbur Edgerton Sanders, E.S. Andrews, L'Homme Masque, or S.W. Erdnase? The search for the author of one of the most seminal works on the card manipulation is among the most hotly debated topics in the world of conjuring research. 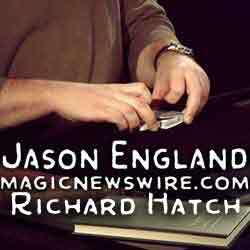 On this episode of the "Spirit of Magic" podcast, I am joined by guest co-host Jason England and special guest Richard Hatch. Richard is widely recognized for his research on the topic of Erdnase and the book "Expert at the Card Table." If you regularly perform close-up magic with cards, then you are certain to have been influenced by this book whether or not you are aware of it. We may just scratch the surface of this fascinating topic in this episode, but it is a fascinating and educational conversation that you need to hear.